Shri Abhishek Singhvi said in the national effort on foreign affairs the primary focus is India has to be India and the Congress Party has always stood for that but in the context of the recently concluded Chinese President’s visit, we are forced to say that all the good nice words, all the symbolism, all the imagery is on one side and concrete things happening in India on Indian soil stand on the other. It is regrettable that brazenly, blatantly insolently while noises of the right kind are made at one end of India, at the other end of India, there were incursions, intrusions, and infiltrations right under the very nose as the two top leaders talk to each other. This is absolutely unsupportable, unacceptable and we must make it absolutely clear beyond doubt that for Indian sovereignty, Indian self-respect, Indian ethos and Indian approach to foreign policy, this is unacceptable. What is even more unacceptable is that despite a consistency of these events happening and there is this consistency and continuity even if you look at only post May 2014 till now. Despite this consistency and continuity of these absolutely unacceptable incidents, the Prime Minister has not clarified or spoken to the nation or given a statement in any form in any manner. This is a second extremely regrettable fact. There is no official statement by the Prime Minister who alone should be tasked with this obligation but to the best of our knowledge, there is no official statement apart from the Prime Minister, not even anybody sufficiently senior in the system and in the hierarchy. It is obvious that the government is either treating these issues very lightly or ignoring them or absolutely not giving it even partly the importance they deserve and we as a responsible opposition party cannot possibly allow that to go unchallenged. I don’t want to give you details but from May I have the exact area, the name of the village, the date when these people have done the infiltration and the incursions right up to 3-4 days ago when all the imagery was being telecast from Gujarat on the visit. To give you a few major examples only on June 13 Chumar and Dimchok, on July 16 further incursions in two remote areas in Laddakh. On July 18 again there is a statement by the Home Minister. On July 22, a fresh incursion and in Dimchok, I have got all the details but what is astonishing is that the President of China is coming this week i.e. the last week you have from Sept 17, Sept 18 i.e. hours before the President landed, then you have Sept 20 and Sept 21 is extra ordinary because there are 100 Chinese soldiers pitching tents all over Chumar. Now is this not an insult to India, is this fair on India. Quite frankly and very humbly I would like to submit that not only the Prime Minister is obliged to talk to the nation on this, he is obliged to make a strongly worded communication to the Chinese President also and to share it with this nation. There is no point making the right noises when the hiatus between ‘kathni and karni’ between preaching and practice is so large. There is another interesting and very sad aspect to the Chinese issue. I will be briefing on this but this is very-very serious and important. I have distributed and most of you would have it – a short bunch of papers 3/4 papers. Now I want to make it simple – turn to the Enclosure I. We have marked very roughly for your convenience ‘A’, ‘B’ and ‘C’ on enclosure ‘I’. This ‘A’, ‘B’ and ‘C’ – ‘A’ stands for Arunachal Pradesh; ‘B’ stands for Aksai Chin and ‘C’ for a large part of J&K. So that is point 1 – now having located these three areas, please note this is the map distributed by the Additional Chief Secretary of Gujarat Mr. Pandian at his Press Conference on 17th Sept 2014 at Hotel Hyat in Gujarat in Ahmedabad and this was shown in these three ‘A’, ‘B’ and ‘C’ – you will see clearly that Arunachal Pradesh ‘A’ in the map distributed by the constitutional functionary Addl. Chief Secretary of Gujarat is shown in dotted lines clearly as a disputed territory, please mark that the main lines are clear, Arunachal Pradesh is dotted, it is more like a disputed territory. Aksai Chin which is ‘B’ is shown fully as Chinese territory – white and J&K next to ‘B’ i.e. ‘C’ is again shown in dotted lines. Now I have two or three questions actually that we will be clear with you – these are maps distributed and the maps carry the description which was distributed by the Gujarat government – Gujarati is on top the translation is by us which give you the details. No problem on the translation. The point I making is two-three fold. Point No. 1- it is a distribution by the Addl. Chief Secretary – Point No. 2 – it is a distribution of map which show clearly Arunachal Pradesh as disputed territory because it is in faded dots – Aksai Chin is full Chinese territory and J&K as again more faded dots just like Arunachal Pradesh. Secondly now, obviously, the purpose of the Addl. Chief Secretary was to talk about Gunangdong and Guanqzhou which is also in the map but in doing so neither the government of India as central government Foreign Ministry, the Prime Minister of India nor the Addl. Chief Secretary of Gujarat have taken care that while talking of Gunangdong and Guanqzhou at least from Indian soil, talking of the Chinese under the very nose of the Chinese President’s visit, you are showing parts of India highly sensitive as disputed territory. That is whole point, I am making. I think this is not only a question of lapse, very serious – equally serious – I think is not about the person, it is about the concept of humiliating no less than a Union Minister of State of Home and I am not talking of a human being, I am talking of the institution who takes oath as the constitution of India and you exorcise him as if he is a ‘paraya’ from deliberations and I am asking myself the question – if a government of India Minister visits China, will they tell all persons living around Aksai Chin and Arunachal Pradesh to not to come and kick him out. In particular this is vital when you talk of things like 56” chest ‘Sher aa raha hai’. The sovereignty and the jingoism of India, this of India and that of India, please walk the talk, please at least partially do what you talk about, please don’t say things like and I quote Prime Minister ‘main bharat ko jhuknein nahin doonga, bharat ki ek inch zamin bhi nahin doonga’ – excellent words – we associate fully with the sentiments but don’t humiliate your own Ministers, don’t humiliate the country under the very nose when the visit is taking place. You are having 100 Chinese pitching ten tents; don’t humiliate the country when you are not able to give a statement to the nation or a real strong protest to the Chinese President. Don’t speak these things and do more, speak less. On the question that the spokesperson is a constitutional expert, if there is something legally can be done in this regard, Abhishek Singhvi said we demand first and foremost and I have said so already. We demand that the Prime Minister speaks to the nation in a proper statement on the issues I have raised. We demand that in fact the Prime Minister also in measured but in very clear unequivocal tone, tells the Chinese government. To a question that when the Chinese Prime Minister came last, at least 100 soldiers came inside 20- Kms and our Prime Minister did the same what Modi is doing, Abhishek Manu Singhvi said No, there is a vital difference. You are absolutely right, I cannot stop the Chinese but full action was taken – every action was taken and I do not want to go into details but the end result was that every inch was restored to status quo and I do not support it, I am not talking about you and me but it was restored. Just see what has happened now. In the imagery in trying to do symbolism trying to talk only photo opportunities, are you not being too goodie-goodie, are you not being too soft, are you sending a clear unequivocal message. This is about India, it is not about Prime Minister or the BJP or Congress and it is about India. Shri Singhvi further said the apology, which I think will not be forthcoming but at least clarification, the least accountability which the nation can expect is at least a full clarification – two things – a clarification to the nation and other to share with the nation the kind of tough which you should be writing to the President of China. I mean it is virtually like a slap on your face, if I come to your house and my troops are cutting into your territory. To another question on the delay in taking up the issue of maps, Shri Singhvi said we are a responsible political party. We had tried to get clarification on the same time and again. It has come from Gujarat. The same was checked. We have asked for clarification based on the facts. I don’t think there is delay since there were Saturday and Sunday in between. It is not a matter of delay. It should not have happened. On the question of delay in alliance between the Congress party and the NCP on Maharashtra assembly elections, Shri Singhvi said our meeting is also going on in this regard. I can only say that high level meeting is going on in the Congress party. As far as the Congress party is concerned, we are fully hopeful, we want alliance and we hope that it will be done but finally it does not materialize, then we are competent enough to stand on our own and contest. To another question on the reaction of the Congress party’s response to the recent interface of Mr. and Mrs. Chidambaram with the CBI, Abhishek Singhvi said as far as Mr. Chidambaram is concerned, I don’t think there is any scope for me to add or subtract much because you have yourself in the public domain rightly and comprehensively reported after Mr. Chidambaram’s earlier clarification and I draw your attention to the clarification which has come in many papers and that is simply this. 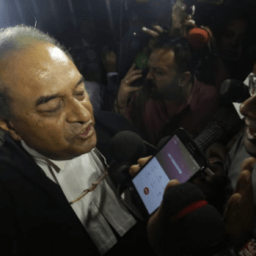 The allegation is a narrow one – that on … date you cleared….. so you did not have the jurisdiction, it should go to the CCEA. The clarification which has come from a large number of officials of that time, this includes the FIPB and very senior officials of Finance Ministry who says that itself is a very easily misleading question because whether it should go above X crore and goes to the Finance Minister and if above Y crore, it goes to the CCEA – that calculation of how many crores it is, depends on whether you look at the face value or the value of investment and it is very clear that if you look at face value it was rightly routed under the transaction of business rules to the then Finance Minister. It is also more important to note that apart from the face value test, this very face value test and subsequently changed in future to provide for investment value to be taken, so I think it will be unfair to fault a person who was following the rules namely the face value as a test then has stood and acted accordingly and now to test him by investment value test which was changed much later. This is not me this has come in the public domain. It has come through from senior officials of the Finance Ministry. Shri Singhvi said as far as Mrs. Chidambram is concerned, this is a matter of fact. I don’t think she is neither an accused nor a witness. Somebody in the CBI is alleged to have asked questions. She has given answers to the same and she has told the press also about the same. The rest is between her and the CBI. What is there to say? 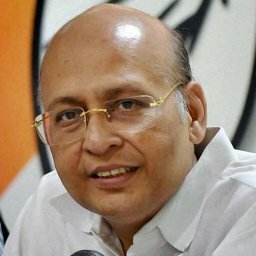 On the question of the reaction of the Congress party over the statement of the PM that in the first 100 days of his governance, he has prepared roadmap for the development of the country, Shri Singhvi said we are very anxious to see that roadmap if anyone can including the PMO show it to us and the Congress party will be so glad to see that roadmap. Secondly, from the roadmap we have seen, it can be said that only the names have been changed, programmes are the same. The policies are the same but with changed names and we feel proud that our initiatives have been taken forward till now. On the question of the reaction of the Congress party that only the AIR and the Doordarshan will be given the breaking news, Shri Singhvi said I am not aware of the full details but it seems surprising the way you are telling. Definitely National broadcasters carry importance but all can get information or the news. Everybody should be treated at par. 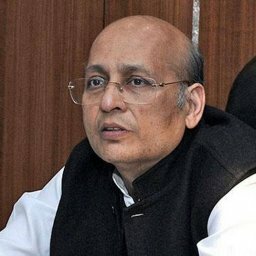 \On another question do you think that NCP’s anticipation of a possible Shiv Sena-BJP collapse is fuelling its go alone aspirations, Shri Singhvi said it would be unfair to suggest that major alliances for major state as Maharashtra is done by not looking at your alliance but looking at others’ alliance. Everybody is a responsible player and they first look at their own details. I don’t think alliance ‘A’ is dependent in the manner you are saying on alliance ‘B’ as a precondition.